As a less expensive option to a hand painted portrait on canvas, yet just as uniquely yours, you can order a custom digital painting of your pet in a preferred environment as a giclee print on canvas for display on a wall. This package includes a phone interview w you about your pet, drafts of the portrait sent to you via email for your feedback so that you get the painting you want, adjustments to the painting based upon your feedback, and an 18in x 24in print on canvas of the final painting. 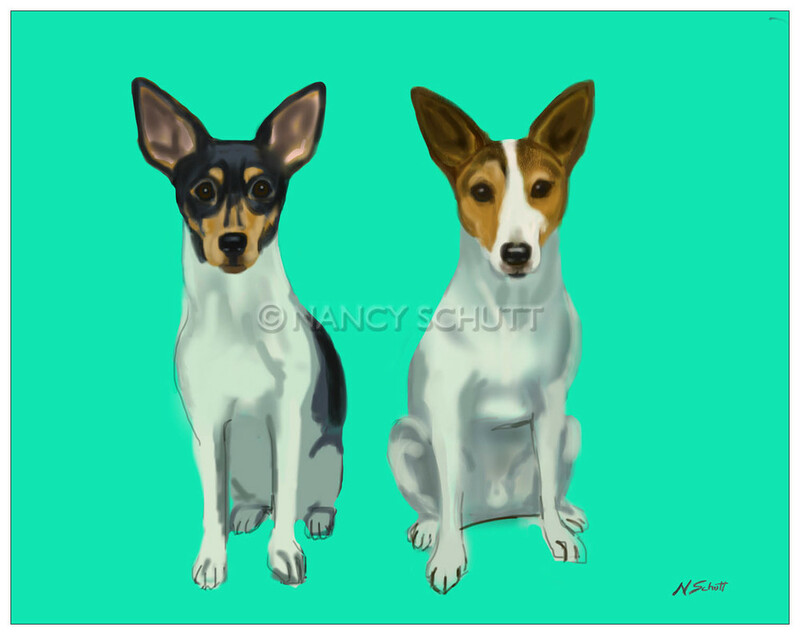 Canvas giclee prints are of such high quality that it's difficult to tell that they are not hand painted paintings, and you would be the proud owner of a colorful custom painting of your beloved pet by Nancy Schutt. A digital painting is still an original custom painting, but it is created on a touchscreen iPad. Package also includes a digital file of the image from which you may create custom greeting cards for personal use. A custom digital painting starts at $850 and includes an 18x24in gallery wrapped print on canvas, shipped to your door at no extra cost.